​Every month a student of the Integral Ballet School is honored for noteworthy achievements, extraordinary behavior and/or general excellence. These achievements may or may not be dance-related, but show what it means to be an exemplary student of ballet. We love to see our students going above and beyond in every area of their lives. 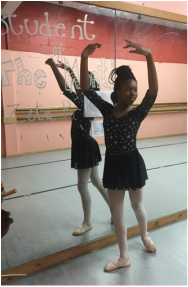 ​This summer, Zeta not only improved dramatically in her dancing, earning her red belt and beginning pointe work, but also began demonstrating what it means to be a valuable mentor to our younger students and a member of the Integral Ballet community. She has been helping out around the studio, student teaching our early childhood classes, and helping her teachers demo combinations in class. We are very proud to see all that she has accomplished in these past months! Way to go, Zeta! Keep it up!